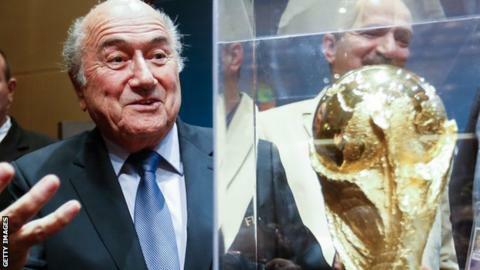 Fifa president Sepp Blatter claims allegations surrounding the Qatar 2022 World Cup bid are motivated by racism. Qatar was chosen as host in December 2010 but corruption claims have prompted Fifa to begin an inquiry. Fifa will rule on the validity of the bidding for the 2018 and 2022 World Cups in September or October. At that point, the 78-year-old president of football's world governing body said the "matter will be closed". Blatter confirmed the latest allegations would be discussed at the Fifa Congress on Tuesday and Wednesday. He said Fifa needed to combat "anything that smacks of discrimination and racism", adding the repeated attacks make him "sad". Qatar overcame competition from Australia, Japan, South Korea and the United States to be named as 2022 hosts. But the bidding process has been hit by a series of corruption claims. Lawyer Michael Garcia is leading an independent investigation into the bidding process and is due to deliver his report to Fifa in mid-July. Blatter told delegates from the Asian Football Conference that Garcia would also speak at Fifa's congress to update delegates on his inquiry. Garcia is investigating everyone connected with the bidding process for both the 2018 World Cup, to be staged in Russia, and the 2022 event. Qatar's World Cup organising committee continues to reject claims of wrongdoing and says it is confident the vote was won fairly. Meanwhile, Africa's football chiefs have attacked the media - "notably British" - for what they called "repeated, deliberately hateful, defamatory and degrading attacks" on the integrity of the Confederation of African Football (Caf) "and the entire African continent". In a resolution posted on its website, Caf hit out at reports placing the region's football administrators at the centre of allegations of bribery to secure the 2022 World Cup for Qatar. Caf added it would urge the executive committee "to file a law suit, if necessary, so that the authors of this smearing and defamatory campaign against African football leaders are brought to book".